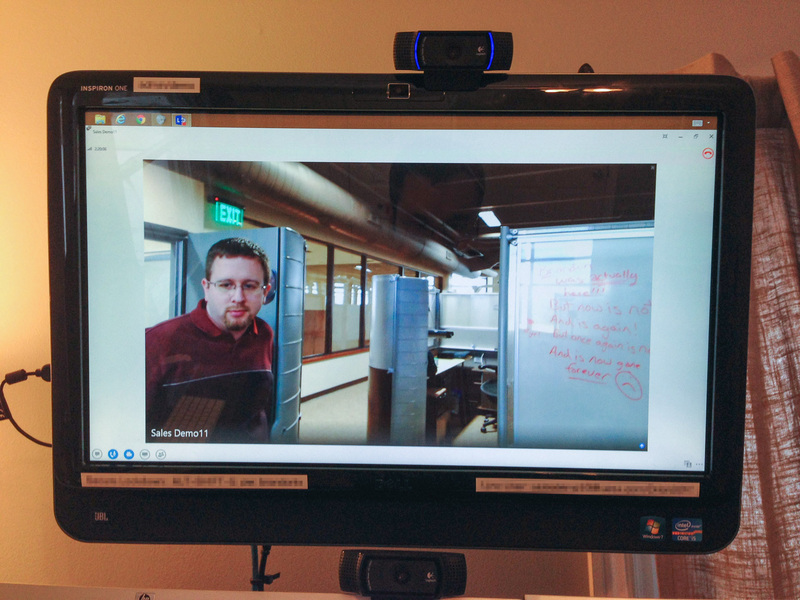 During my time working for Orion, we had a two-way video conferencing solution that we put together to make my remote status more visible on-site. 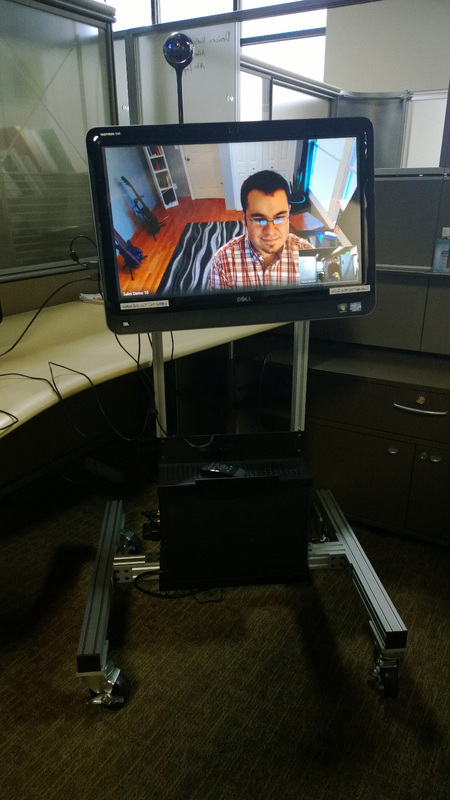 We dubbed it “The Virtual Presence” (or VP for short), and overall, we found it to be a successful means for making me more like an on-site employee. I felt it would be a good mini-case study to put together, so here’s my quick overview of my previous remote working conditions. I treat working from home as an office-away-from-the-office. I have a dedicated room where I have my workstation and I can close myself off from the usual house activities. My work hours are generally 8:00 AM to 5:00 PM, with an hour lunch at noon; I treat these hours truly as working hours, and I try to keep my non-work activity to a minimum. It definitely does take a certain kind of person to work at home, but I’ve also had well over five years of practice. This provided a decent angle on me, and was easy for me to glance at and get a feel for what was going on in the office. To provide an exceptional video experience, I had a Logitech HD Pro Webcam C920; it gave a good feel of me in my office, and had stellar video quality. For video, we used the Logitech BCC950 Conference Camera. Following one of Scott Hanselman’s posts, and using a modified version of his auto-answer software, I was able to remotely call into their side, have it auto answer with video, in addition to me being able to control the camera’s direction and zoom. For the most part, the auto-answer and control software worked relatively well. There was the occasional hiccup, but nothing that couldn’t be solved by IM’ing someone to fix their side. That’s the big question, isn’t it? There’s obviously a fair amount of cost, setup, and time to get this kind of setup running. Both sides also need to be open to the idea of creating a virtual tunnel between a home location and the office. In our scenario, it definitely was worth it. We were a small team, 3 to 6 members, with its own physical area in the company. I truly had my own cube where my VP sat most of the time, and I could easily see my other teammates. Being able to hear the “open air” conversations was extremely beneficial to me, and was in turn beneficial to my team because I knew exactly what was going on during our more formal discussions. 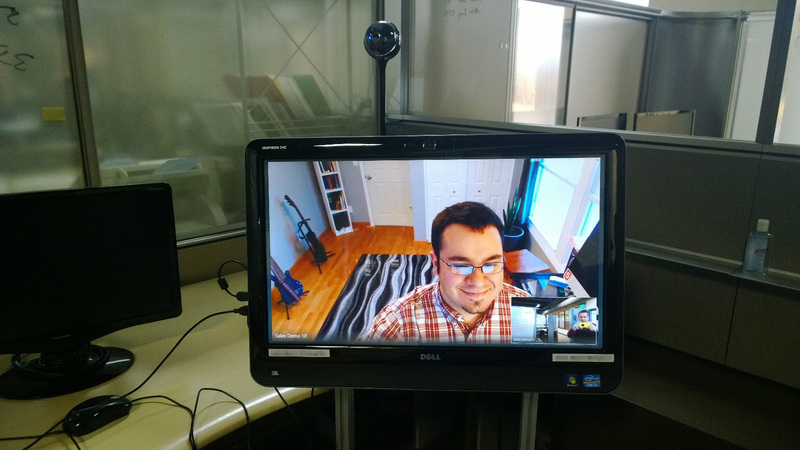 Also worth mentioning is that we made video conferencing a key component in not just our VP setup, but in almost every conference call. I would recommend that if you have remote workers, regardless of building a VP, include video at least some of the time. It’s amazing how much more connected you feel when you can see who you’re talking to. Communication was greatly increased. Obviously, this was the primary objective of the entire project. It’s hard to deny that I had better communication, and presence, within my team thanks to the VP. Additionally, it made me feel more “at home” with my team; I wasn’t just “some remote guy that we have do stuff”. I was truly a team member. Distractions. There are certain things that you can control in your own home that you can’t in the office, the level of distractions being one of them. Sadly, one thing that carried through the VP was any distracting noise, such as HVAC work or the annoying lady that coughed up a lung every five minutes. Checkout the “Freak Show”. You know how you drive by a crash on the freeway and almost instantly rubberneck? Something about that pile of metal that just grabs your attention. Well, sometimes I would be that pile of metal in the office. The VP was definitely a novelty, and would grab serious attention from anyone who wasn’t aware of what it was or who I was. While it did increase people’s awareness of who I was, it was definitely awkward at times and was an additional distraction. Do Not Disturb. Luckily I had two remedies for any sort of excessive distraction: the mute button and ending the call. If I needed DND time, I could end the call and call back when I was ready. Or if I still wanted to see what was going on, but not be distracted by sound, I could just mute the speakers. Along the same lines, I usually kept my microphone muted so that I could listen to music without distributing any of my teammates. 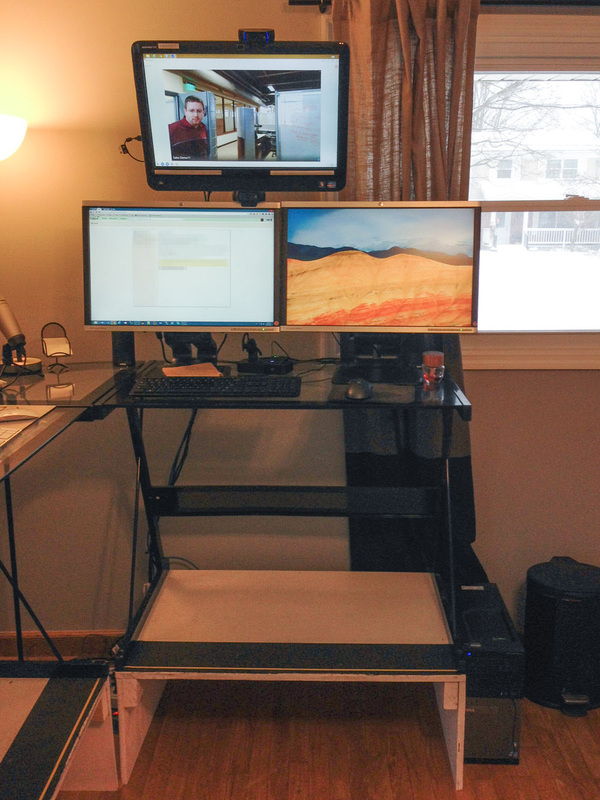 Working remotely is still in its infancy. We in the tech community, and beyond, are still trying to see exactly how this fits in our workflow. At Orion, we found something that worked reasonably well for our team. If you’re just starting to look into how to use telecommuting to your benefit, whether you’re the manager trying to manage remote employees or if you’re the worker trying to better communicate and integrate with your team, I recommend you do your research and, more importantly, try a solution or two. You’ll eventually find something that works for you and your team. I hope that this quick overview at least gave you some inspiration. If you need more, I highly recommend reading some of Scott Hanselman and David Heinemeier Hansson’s work (the latter even has a book on remote work). Good luck!